This morning, Gabe and Lige and gus helped me and we saddled up and gathered a;ll the cows into the lot east of there house, then Chance came with a bale on the tractor and lead them across the road and back down south.. weather is supposed to be good for the next week. Had two calves to tag today., so far. This afternoon I took all the big boys and went to Punkin’ Center where there was roller skating, I am getting to old for this stuff! It was fun and I think I quit when I should have, but maybe not, I’ll know tomorrow morning! It got to somewhere around 70 or above here today, looks like. Hardly a breeze, just a beautiful day the Lord sent us! Chance and I moved the cows all south, well, all but a footsore one and the little corry who has been crawling thru’ fences… I fooled her tho… I took Woody and we started south of the road in the stack where she was at, went on a merry chase out east, back west, up north and finally back to the corrals. I had the gate shut on that side and the other open on the other side. Tate had been working on the new house, so I hollered at him to come help, but he’d left… So I thought of my phone, but couldn’t reach him. I then called Kass and she came up and saved the day by shutting the one gate and opening the other.. all the while me and Woody had a loop built and a hungry look in our eyes so the rip would not leave where she was… got her in and Gramma helped me this afternoon and her horns are a lot shorter, we’ll see if that changes her attitude, if not, she is going to end up hamburger! I took the loader tractor and cleaned up some manure scattered around out in the hog pasture. I let the Haflies out there and it was a 3 ring circus, they bucked and jumped and ran and ran… finally the other horses up west must have heard them cuz here they come flying down the hill. 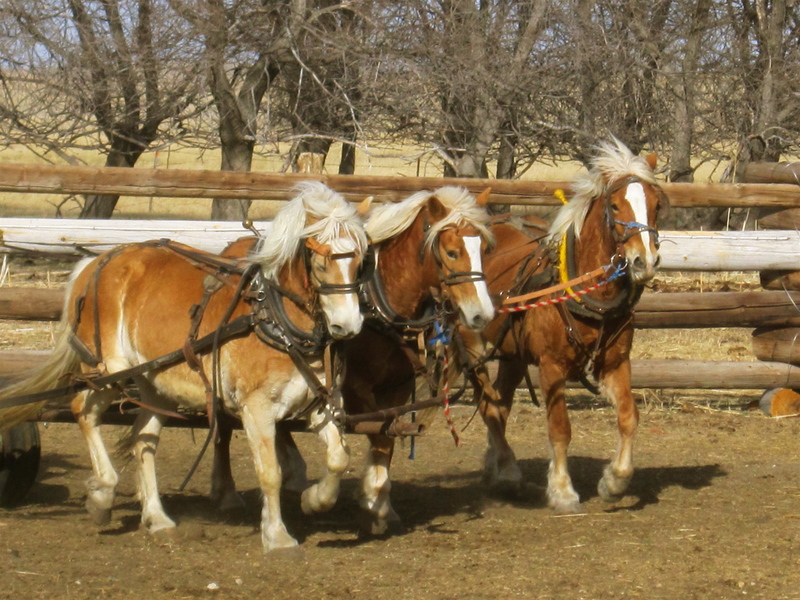 They were all standing at the back of the corral, so I slipped out and let Beaver in, so now when these kids want to ride, we got something in besides a pony they can. Also, Chance and I hauled a few calves to the sale, yesterday and also dropped a bad eyed calf and their male pup at the vets to both get fixed, went on to the sale, dropped off the calves and picked up an old horse Hope and Chance bought for their kids.. We had the vet work his teeth when we picked up the pup and the dog on the way home, so looks like we can get some kids horseback this spring.. now, if I can get someone to top off a few of these others and everybody get to riding them , we’ll be set! Got up in the 50’s today with not much wind until this afternoon. I got done with my morning ritual and then me and Molly went over to Bud’s to let her see sheep and see what she thinks of them. She likes them! 😀 Bud sure liked her. Tried trading me two older, started dogs for her, but I think he’s just trying to get his dog numbers down. We let her have a couples goes at them and she sure was enjoying it. We got Sam and Gus after school so the two boys and I went out and trimmed Charlies feet and then Gus rode him around in the shed. He’s so fat he sure don’t have any withers.. maybe I need to rig up a britchen on him like you’d use on a mule! Got cold and windy and a little snow last night, windchill way below zero today and tomorrow. Cindy had to go work at the polls for a special election. Addy Bear had her 4th birthday the other day and she wanted a tea party so Gramma and I had to go to. 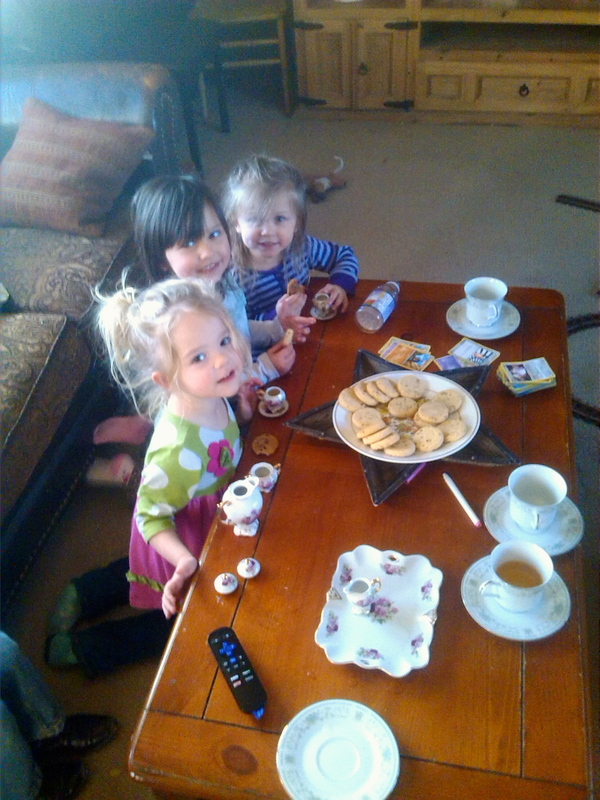 Got pretty good picture of the 3 girl cousins at the table with their tea party.